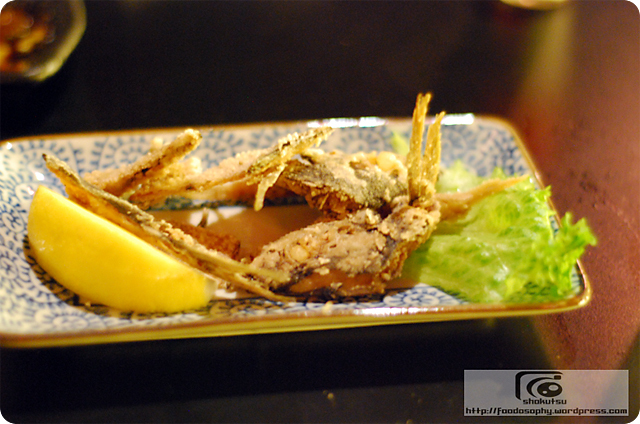 As the boom in interest for the izakaya genre exploded in recent years on the Canadian west coast, there were a few that stood out for me in terms of offering something that I strongly felt would appeal to the local market and tastes. Zakkushi was on the top of this list, especially when you consider their base premise is something that North Americans can relate to – that being charcoal barbecue and grilled meat-on-a-stick. For the newbie, it is a lot more understandable and palatable than say someone just getting introduced to say sushi for the very first time as their initial foray into Japanese cuisine. So it was quite fitting that I visited the Main Street (one of three outlets of this business that is fast becoming a growing chain) with a friend of mine who self-admittedly noted that he didn’t grow up with a lot of “ethnic” food in his parents’ home in rural Saskatchewan, and even today, his folks aren’t that adventurous but he’s learning to branch out his eating repertoire now that he’s based in Vancouver. I thought I’d try and shock his system by introducing to him something that I was positive he would find odd and wonder why anyone would want to eat it. This year marks the 34th annual Heritage Festival, continuing to celebrate Canada’s multicultural heritage. As a small child – I can remember helping out within my cultural pavilion, and later as a participant in one of the cultural presentations. Some 20 years later, I now attend only as a patron – armed with my trusty fork (my contribution to being green, as I plan on sampling a LOT of food). Foodosopher: I have the same memories, working with my cultural pavilion – being a patron is much better! My biggest wish with the Heritage Festival is that they were a little more green – so much waste with plastic and wooden forks and plates, but hopefully over time they will implement better measures. This may seem like a slightly odd place for a review for foodosophy – but it is well known that one of the major elements of this festival is to showcase various eats from the participating countries, thus making this my favorite festival held in Edmonton. Foodosopher: My friends and I may joke about it as meat on a stick, and meat in dough festival, but you’re right that it does a wonderful job of showcasing many new dishes and cuisines in a town that doesnt have the population base to support restaurants for all the different ethnicities whom live here. Arriving fresh off the bus (as there is no parking on-site), we headed straight to the festival grounds. Armed with my fork, my food-bank donation, no plans, and following only the smells of bbq meats, and cooking sweets – we found ourselves at the France pavilion. Foodosopher: personal rant inserted – it is the biggest food drive for the Edmonton Food Bank each year. Please everyone, if you attend Hertiage Festival, bring a nice donation. If you are a foodosophy reader, chances are you’re very lucky relative to many people who struggle to feed their families each day. I know how lucky i am! France was offering crepes with one of four options: chantilly (whipped cream), nature (sugar), suzette (Grand Marnier sauce), and chocolat. With my wife leading the way – there was no debate – chocolat all the way. They even had a cute café tent set up so you could sit down and enjoy your crepes and a cup of coffee. Not the same as sitting at a café along Champs-Elysees, but nonetheless a great start to the day. Foodosopher: we met our friends outside the French Pavilion as well. I passed on starting with dessert, and decided to dive in with some meat instead. A few tents down – Japan was offering Hiyayakko, Okonomi-Yaki, Takoyaki, and Yakitori. Nothing against the options, but with all of the various bbq’s cooking away -my immediate need to satisfy my weakness for meat on a stick led me to the yakitori. Foodosopher: Interesting note – there are some food vendors who do not belong to any cultural pavilion – they offer food as well, but as a stand alone enterprise. The churros station, and the fried potato station were both unattached. I sampled both, and they were decent, but overpriced. Ecuador. This caught my eye as some friends recently returned from a trip to the Galapagos Islands. Reading the menu with my limited Spanish, I saw an item that I didn’t recognize – so I had to give it a try. Caucara con Papas (beef strips with potatoes). Upon receiving a dish with thinly sliced potatoes, an onion heavy salsa, and marinated beef strips, we found the closest picnic table and dug in. This was excellent – cilantro/lime flavours dominant in the salsa, thinly sliced potatoes with red and green peppers, and tender beef strips marinated in a mild cumin/chili spice. 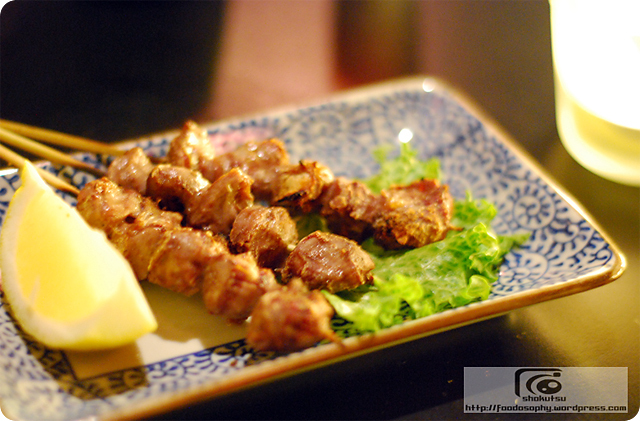 Foodosopher: My first stop was the Peruvian pavillion for anticuchos – marinated beef hearts. 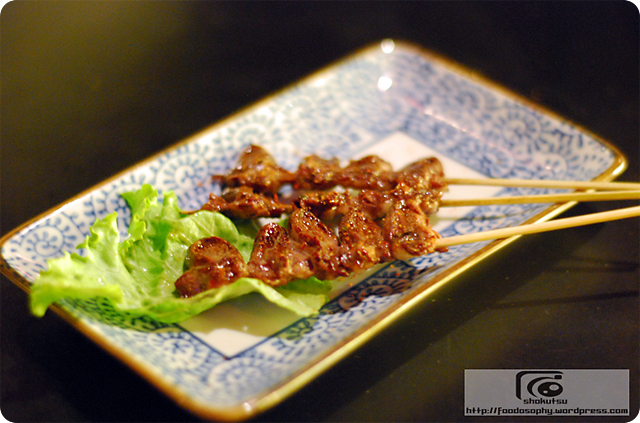 While many people are put off by the thought of organ meat, there is nothing tastier than marinated, grilled, beef heart. Seriously one of the best dishes all day. I fell in love with these in Peru – give them a shot. I followed this up with an Arepa from the Ecuadorian pavillion – it wasnt on the original menu, but I was curious how their take on the traditionally Venezualan dish would be. It was a crispy flat puck of corn – with a tasty version of chimchurri and grilled beef. Very good, if a bit of a bastardization. Taking a short break from the eats – we toured pavilion after pavilion, each selling an assortment of clothing, crafts, and gifts. Outside of the various tents – many also provided entertainment in the form of dance or music. Continuing to sample various eats along the way; Green Papaya Salad from Lao, Pyrohy from the Ukraine and a Serbian Cevapi, we eventually hit our first food shortage in Mexico – as they sold out of their tamales. Foodosopher: I had just missed the tamales as well – by about 10 minutes. People walked by me with the tantalizing morsels. I wasnt pleased. Instead, i had to settle for beef curry from Sri Lanka (good), Samosas from Fiji, Empanadas from a variety of South American countries. The Korean pavilion was host to an artist who was painting on site – which had me entertained for some time. The cooking bulgogi got me hooked, so we slid in line for their combo offering of beef, kimchi and rice. This was so good – we were tempted to go back for seconds. 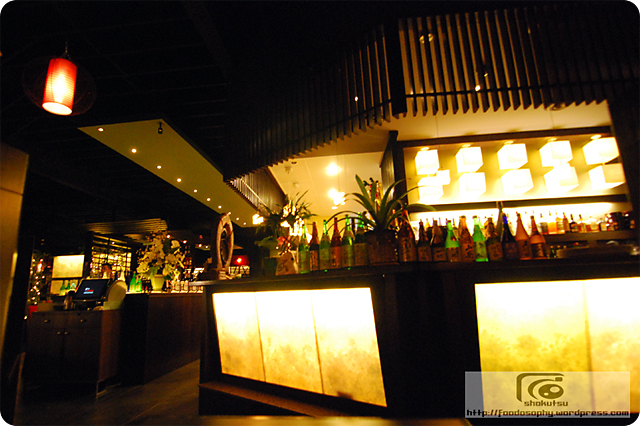 Foodosopher: The bulgogi was excellent – better than any Korean restaurant in town. Tender, flavourful, perfect taste and texture. Must try! As we sat enjoying this meal, we struck up conversations with our picnic table companions. They raved about the scovergi they had at the Romania pavilion. Fried dough & icing sugar? Twist my arm. Having seen these before in other settings — I was a little curious whether this item has morphed towards carnival fare, rather than being a true cultural food representation. Especially due to the fact – we Canadians like our donuts (we have the most donut stores per capita in the world). My curiosity increased when I noticed the Croatia pavilion was also offering an identical item. So after some post trip reading, I discovered that the Romanian scovergi to be the closest in representation – where the only Croatian reference to fried dough I found was the krafna, which didn’t quite matchup to the dish they were serving. This item was definitely a crowd grabber – as the lineups for this got larger and larger throughout the day. I’m surprised it’s not on the local Timmy’s lineup yet. Foodosopher: I passed on the scovergi, as tempting as it was. Had some plantain from the Afrika pavilion, and Burek from Bosnian pavillion. Burek was covered off in in the post on European Deli and was sadly not as good at Heritage Festival as the European Deli, nor as good as last year. The dough was limp, the meat overcooked and not spiced well enough, this was disappointing. Deciding to scout out something a little more true to the spirit of the event, I scanned the festival menu for something else to satisfy my sweet tooth. The Dutch pavilion, tucked away on the far end of the festival grounds were serving poffertjes (small pancakes with icing sugar). Bite-sized pancakes, light and fluffy, and doused with icing sugar. (Note to self – turn your back to the wind, as a small gust of wind covered my shirt with icing sugar). Foodosopher: had these last year – wasnt super thrilled with them. Overall – a great day, good food, mixed with a nice long walk in the sun. I heard a couple people groaning about the cost of food – but I see this event from the perspective of being a fund-raiser for each of these cultural societies, and will gladly support them to keep events like this going! Foodosopher: finished with some mango, and jerk pork. I fell in love with jerk pork at Scotchies in Mo’Bay, Sadly, this pork was average at best. One piece was excellent, though without sufficient kick, but the other two pieces were overly dry and unflavourful. The fetival that came with it was good as well. Held annually on the August long-weekend (first Monday of August is ‘Heritage Day’ in Alberta), I hope this post entices some of you to visit next year! Foodosopher: Amen to that. One of the best festivals anywhere in Canada. Well worth the visit. 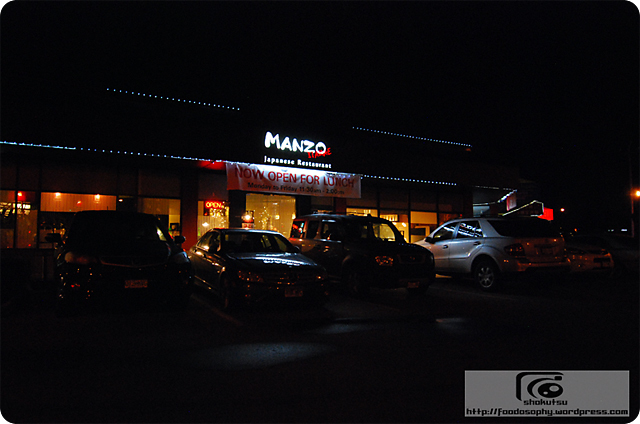 When I first laid eyes on the “Manzo” lettering on a random drive past this building, and then saw the “Japanese Restaurant” noted below it, I thought how odd. Isn’t Manzo (and perhaps the occasional Foodosophy commenter of the same name can confirm) an Italian surname? I know I’ve come across it being attached to pizzerias in other cities. Then I remembered that its also an old (eg. in that no mother would use it anymore to name their child) male given name used in Japan. In fact, history recalls that the first Japanese to be documented to have arrived in Canada was a man with that first name. Another part of me wondered if they were using part of the word, “manzoku“, which would mean “satisfied”, and can be used to describe how one feels after having a wonderful meal. Not knowing the ownership group involved, this is all speculation. And whoever it is, its clear they were not adverse to spending a good chunk of change on the interior aesthetics. 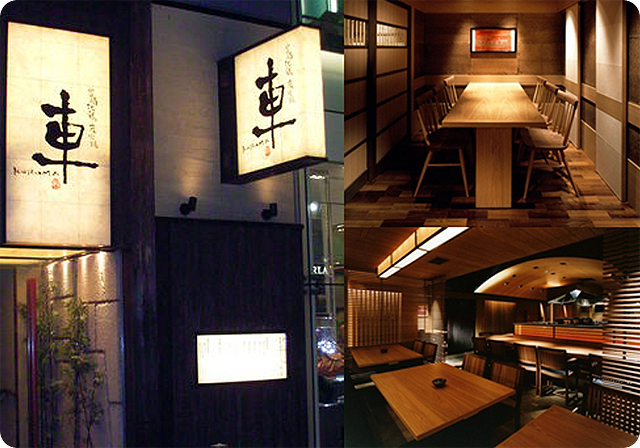 I’d even suggest that they have taken some cues from the likes of the Japanese izakaya chains such as Tsuki No Shizuka or Wan, with their use of wood paneling, dim lighting, and overt displaying of large sake bottles. Although it did not incorporate the high value and historically significant authentic elements of Kakurenbou, overall it was still visually appealing and contributed to the relaxing and quiet mood we had that evening. As I lament the great izakaya that I’ve left behind in Tokyo, I must say that the best for kushiyaki (or more specifically yakitori) in Vancouver still remains, at least for me, Zakkushi on 4th. But despite this, I was interested in trying the offerings here, and with a willing and able dinner partner, I selected some of my old standbys. And that means, none of the usual Canadian-friendly yakitori suspects like negima (breast meat and green onions), tsukune (minced meat), or tebasaki (chicken wings). Nope for me, a good yakitori-ya must have the likes of gyutan (beef tongue), sunagimo (chicken gizzard), hatsu (chicken heart), and even nankotsu (chicken cartilage)! A recap of some of these pictured selections would be that the beef tongue ($6.95) was nicely grilled, not overly so that it would entirely lose its chewy texture. It could have used some more salt, though the dash of acid from the lemon did give it the required punch. The hearts ($3.95) were a big disappointment. To the unknowing eye, they might have slipped it by, but they should not have been sliced in half thus revealing the two chambers, and trying to spread things thinner than they should be. The key part of these kinds of parts is the texture and without the plump morsel intact, it lost its luster. Lastly, the sunagimo ($4.95) was simply okay, not a complete bastardization like the gizzards were, but again under seasoned. Texture-wise it is a bit stringier than the hatsu, so its often a case of which you prefer – the more velvety smoothness of the hatsu, or the jaw-ache inducing “toughness” of the gizzards. Shifting to the seafood portion of the menu, the Ayu Shioyaki ($6.95) was again properly grilled and the quality was reasonable. Being a fish with less fat than other popular salt grilled fish, the meat texture held up through the cooking process, and the flavor suggested it was fresh. I think we could have easily stomached a pair of these, I should have remembered that the Ayu is generally on the smaller size compared to Sanma (pike mackerel). 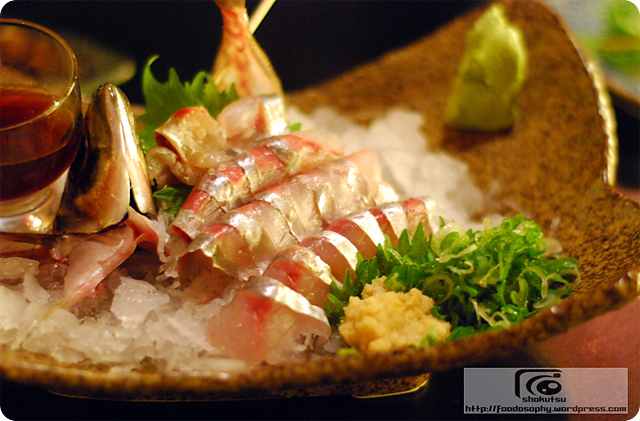 The highlight of our dinner (and the most expensive at $24.95) was easily the above pictured Aji Sashimi. When we spotted it in the menu booklet, it just stood out. I just don’t see it on many other menus around town, perhaps I am just looking in the wrong places? Being a year-round fish that remains in season, I do hope Manzo continues to keep it on their menu, as I’ll definitely be back for this refreshing, light fish with its distinctive flavor. Coupled with the freshly grated ginger and green onions, it really is fantastic. For those who are unfamiliar with this, I suggest you try it out. To close our our meal, the traditional zousui (a chicken one, they had others) is basically a rice porridge that is made from a dashi broth, although in this case, there was something “off” about the flavor combination. 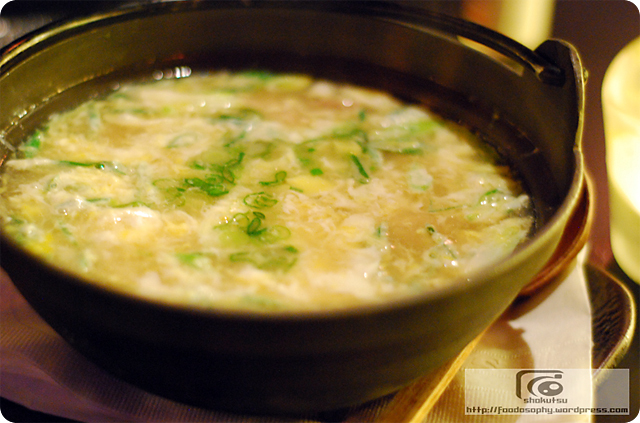 I felt it had a thicker consistency than it should have and the dashi didn’t taste right. I’m not sure what their base broth is (perhaps they use it in their udon dishes, etc.) but I was not entirely happy with it. Thus regrettably, the closer was a let down, but we were both quite full by this point. 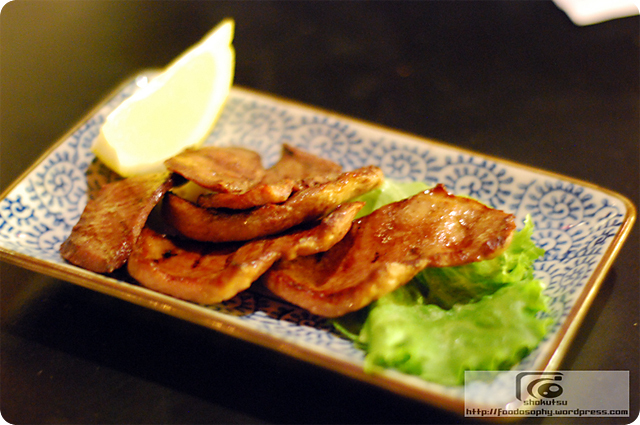 With an extensive menu of typical small plates found in an izakaya, I think there are some others that I am interested in trying, and given the comfortable mood of this place, I think I will make an effort to come back. If not just for the Aji. Perhaps its my advancing age that is making me stray away from the boisterous izakaya scene that the likes of Guu provides, but I did find I welcomed the relative peace and quiet of Manzo. But I do realize that the noise and confusion of an izakaya is also a key ingredient to making them so fun with friends. With eight locations in Tokyo, and six locations in their homebase of the Kansai region, Kuruma has established itself as a leading group of restaurants under the umbrella of a company called Idea Co. Ltd. This conglomerate also operates another chicken-speciality chain called Torikagura, as well as a pair of teppanyaki restaurants called Midou and Kanrou, as well as a kushi-katsu restaurant called Dankeh. 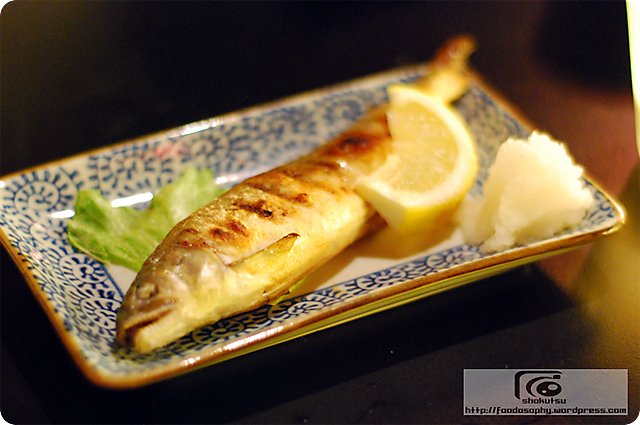 Kuruma is all about serving the very best Miyazaki Jitokko (commonly shortened to Jidori). Broken down, Miyazaki is a region on the southern island of Kyushu (which likes to call itself one of the “four season food baskets” of Japan), and Jitokko refers to an indigenous breed of free range chicken found in both Miyazaki and nearby Kogoshima. It is recognized that through agricultural research and cross-breeding experiments (involving Jitokko, White Plymouth Rock, and Kyushu Road breeds) beginning in about 1965 resulted in the discovery of what is known in present-day as Miyazaki Jidori (officially branded as such in 2004). Sourcing from Miyazaki Jidori producers on a direct contract basis, Kuruma is able to bring the highest quality and absolutely freshest product to their outlets (apparently, gate-to-plate in under 24 hours). For comparison, consider that Miyazaki Jidori is raised over 180 days, whereas regular supermarket chicken is speed-raised in just 90-120 days. The resulting difference is improved taste, quality, texture, fat, lack of gamey smell, all without the use of growth hormones. Though this does make raising Miyazaki Jidori a very difficult proposition, and thus this premium brand is carefully protected both by farmers and their related industry associations. Sort of like the way Miyazaki Beef is as well. If you’ve ever had this premium beef, you’ll be even more amazed at what this prefecture does with chicken, and quickly understand why it can hold its own as a specialty restaurant serving only this product.